In honor of Easter and the Disneyland Resort Egg-stravaganza, I wanted to take a look at a unique way to find, love, and incorporate a different kind of Easter egg with some special twists for the little ones in your families. The concept of the Disney "Easter egg" within a Disney film is nothing new. From a strategically placed Mickey silhouette to the cameo of a Disney Princess, these hidden gems are one of the many things that make Disney magical. These "Easter eggs" are also ever-present at the Disneyland Resort and add a unique and interesting way to engage your little Disney fans in the fantasy and history of Disney. While some of these Easter egg might not be "new" to some of our more experienced Disney travelers I hope seeing them through the eyes of a child will add some new excitement to the experience. Many of you with little ones know how exciting getting mail can be for kids. Real mail with stamps and envelopes is something that is so rare that it's now a novelty. With that in mind, imagine setting out on a quest for the Disneyland Resort mailboxes. Located all around the park, the mailboxes are a lovely tribute to the history of Disneyland and can allow you and your little ones to mail postcards to family, friends and yourselves; serve as souvenirs; document your trip; and greet you in the mail upon your return home. Some of my favorites can be found on Main Street U.S.A, the entrance to Autopia and near the Pacific Wharf Cafe at Disney California Adventure Park. What happens soon after finishing lunch with a 2 year old and a 5 year old? One or both ask for a snack. With that, we find ourselves seeking out the closest popcorn cart, one of their favorite treats, and also the topic of our next Easter egg. If you have ever looked closely at the popcorn carts located around the resort, you might or might not have noticed the unique characters that slowly "turn" the popcorn hour after hour with little to no acknowledgment. These hard workers, which range from Santa to the Yeti, are a good way to spend time distracting yourself and the little ones while in line. Fantasyland is full of great surprises, history, and photo spots along with some of my family's favorite attractions. One of those attractions is Snow White's Scary Adventure, which features something you might have never noticed: The Evil Queen in the window above the ride entrance. Keep an eye out as she moves the drapes and peers out to view the spectators below. In addition, right across the way, at King Arthur's Carrousel you can try to find and ride Jingles, the horse dedicated to Julie Andrews and Mary Poppins, that features ornate bells and a tribute to the quintessential magical nanny. While you wait in line, which is never very long, you can show off one of my go-to pieces of trivia. What is the difference between a carousel and a merry-go-round? Carousels feature only horses and merry-go-rounds highlight animals and characters of all shapes and sizes. Next on the adventure is one my oldest daughter's favorite things in the parks. Located in the shade between the Royal Theatre and Princess Fantasy Faire sits a rather non-descript music box with a hand crank known as Clopin's Music box. 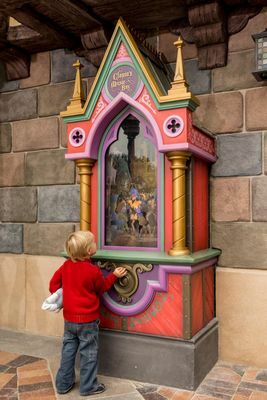 A tribute to The Hunchback of Notre Dame, this detailed and interactive music box features the song "Topsy Turvy" and does a great job adding a little magical touch to the area. I love when two Disney films or characters collide and my little ones discover something new in one of their go to attractions. One classic example of this can be found in Tarzan's Treehouse where you can stumble across two beloved characters, Mrs. Potts and Chip, hidden among the treasures and trappings. If your little ones enjoy finding their favorite characters in unexpected places, then a closer look at "it's a small world" should definitely be on your list. While this Easter egg hunt is not new to the attraction, it provides a great interactive way to experience a classic ride with younger ones, whose attention spans might be shorter than most. From the very beginning of the ride, mixed among the classic figurines, look for your favorite Disney Princesses, members of the Fab Five, and other popular characters. What I love most about it is you notice something new every time. Finding ways to uncover hidden surprises with your little ones is a great way to build a love for all aspects of Disney, even at an early age. Happy hunting.